One of the best parts about working at a bead store is meeting local beaders, every day introducing us to new artists and projects. Nancy LaHatt of “Keepsakes by Design” has impressed us with her intricate, yet delicate tatted lace designs, so we’ve asked her to make some hand-tatted components to sell as our November Artist of the Month. Nancy’s finished jewelry and lace components will be available for sale at the Bead Bazaar throughout the month, so make sure to stop by and marvel at the products of this talented woman’s patience and dedication! Her work can also be purchased on her Etsy shop: http://www.etsy.com/shop/designedkeepsakes. What kind of tatting work do you do? A: Different types of tatting use different tools. 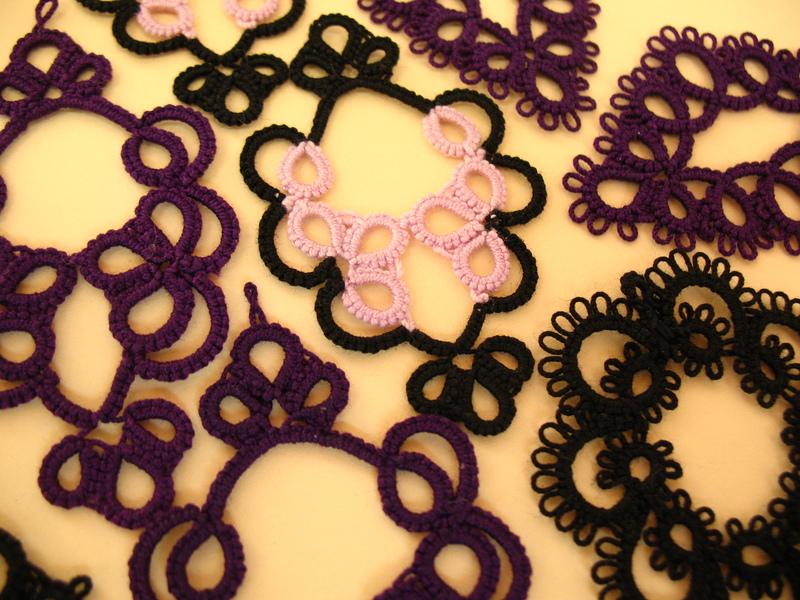 I do traditional shuttle tatting in which a shuttle is used to hold the thread as you make the lace. The shuttle is specially shaped so you can go in and out of your working space easily, helping with speed, and it has a little tip on the end for working with picots and to help unpick knots. 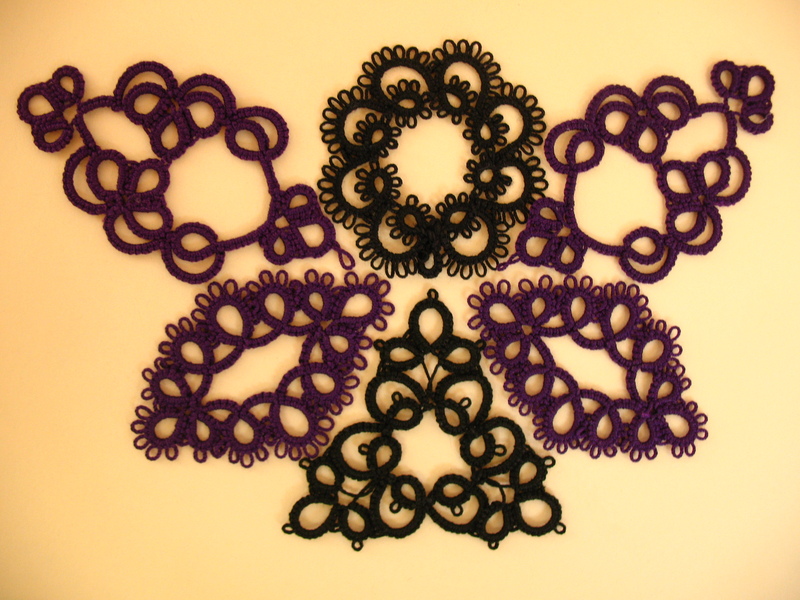 Tatting is completely different from bobbin lace, which I’ve also done a little bit of. I like to use traditional size 80 thread- it’s a small size for tatting and produces a more delicate piece. For tatting I like to use cotton or silk thread. You don’t want to use polyester because it stretches, which will warp the piece. 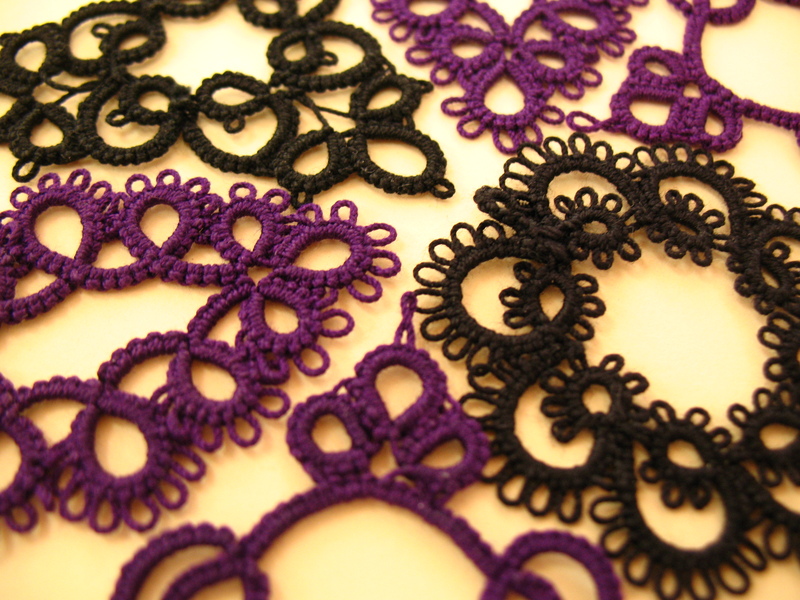 Q: How long have you been tatting lace? A: All my adult life; I’ve always been interested in fiber and have spun wool before. I saw lace making patterns in the old workbasket books and magazines, and my interest grew from there. The history of lace making is amazing! Tatting has at different times been considered both as a “beggars lace” and as a graceful way for ladies to display their hands. Lace making is sometimes called a dying art, but it’s becoming more and more prevalent these days, to the point that modern books are reprinting old patterns. Q: How did your business get started? A: I like doing the tatting as a hobby and always have many pieces left over. I originally gave extras away as gifts, but then Etsy was recommended by a friend. Q: How did you come up with the name “Keepsakes by Design”? A: I was thinking of items that people would want to buy and keep forever and ever. A: I like to call my style neo-Victorian, an antique Victorian look that also ties in well with the Steampunk aesthetic. While I use a traditional tatting style, I add my own elements. For instance, traditionally all lace is white, but I step out and use different colors. A: I love watching period pieces and seeing the designs of the costumes! They do a good job of taking the old styles and being true to their techniques. Q: Has anyone been an influence to your work? A: I’m mostly self-taught. While most lacemakers are very sharing of their knowledge, it was hard to find people to teach me because it wasn’t as prevalent at the time. Now there are lace making clubs all around, like the Lacemakers of Puget Sound. Q: What other hobbies or activities do you have in your life? A: I do knitted wire-work and have done the Viking Knit. I like hobbies that I can take with me where ever I go. Q: Do you have any hopes or ambitions for your business in the future? A: Just to keep doing what I’m doing because it’s relaxing, something I enjoy doing. I want to do more reaching, and I’ve told anybody who sees me doing it that I’m glad to teach them. Passing on what I know is very enjoyable.